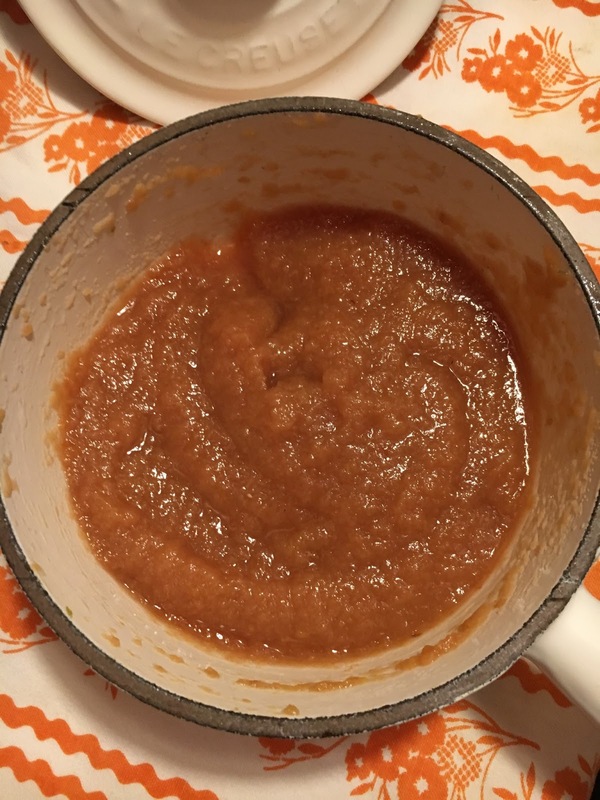 Making this applesauce from the October 2017 issue of Bon Appetit was so simple and yet so richly gratifying, as well as quite marvelicious to the taste! You may read Carla Lalli Music's delightful prose here but I've included the basics below. Pull a few ripe apples from the nearest tree or even purchase a few from your local market. I scored four of the SweeTango variety. Halve them and put in a pot with one cinnamon stick, about two tablespoons fresh lemon juice, and one teaspoon vanilla extract over medium-low heat. Add a 1/4 cup of water, cover, and occupy yourself elsewhere. You'll know it's time to peek in on your pommes when they make their aromatic presence known. If nothing appears to be sticking in your pot, give it a stir anyway, re-cover and let the bubbling merriment continue on for about 45 minutes. Push the goods through a food mill to trap the seeds, stems, and possibly the coded sticker grocer labels (surely there's a more scientific term!). I swear you'll experience a satisfaction equal to that of having collected an armful of nature's precious bounty from a shining orchard--without hardly having to lift a finger.